Chances are your firm includes a mix of Millennials, Baby Boomers and Gen Xers. Even if you practice solo, you run into a generational variety of clients and colleagues every day. So you know firsthand that people from different generations tend to act and respond in different ways. Understanding these differences – and knowing how to weave them together in your practice – is a key to reducing tension, avoiding miscommunication and preventing mistakes. It also makes life in the law office a lot more fun. 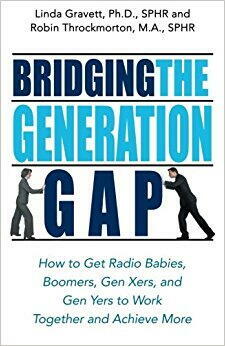 That’s where “Bridging the Generation Gap: How to Get Radio Babies, Boomers, Gen Xers and Gen Yers to Work Together and Achieve More” comes in. The book is the product of five years of interviews with more than 500 individuals across the workforce. The authors – both of whom have backgrounds in human resources – show how to minimizing age-related conflict while maximizing performance. “We also share generational pet peeves gleaned from our interviews, and we will endeavor to debunk commonly held stereotypes in order to help you find and retain the best and brightest of all generations,” they write in the preface. “Bridging the Generation Gap” is one of many titles available at the Lawyers Mutual Lending Library, which is free to LM policyholders. The book is intended primarily to help bosses recruit, train and retain great employees from across the age spectrum. “[T]he labor force is getting older at a faster rate than they can be replaced, so keeping older workers longer and preparing younger workers for succession sooner is critically important in the global marketplace,” write authors Linda Gravett and Robin Throckmorton. Each chapter presents a case study depicting problems that might arise – at least in part – because of generational differences. There is a factual scenario and suggested solutions. Particularly helpful are discussion questions, which provide a ready-made agenda for your next staff meeting. “Bridging the Generation Gap” is a quick read that contains a dose of psychology and a dollop of management theory. It needn’t be read from start to finish. Instead, managers can dip into whatever sections apply to their situation. Also included is a chart showing generation birth-years and a worksheet for calculating turnover costs. “We need to get past notions that such as all 65-year-olds want to retire, or all 20-year-olds are tattooed and pierced,” say the authors. The Lawyers Mutual Lending Library is a free service provided to all insureds and their support staff. We offer a wide range of titles from subject matters including: marketing, networking, starting a law practice and social media. Please visit Lawyers Mutual Lending Library on our website to browse our selection. Check out “Bridging the Generation Gap” and many other titles here.